Here is a real gazebo, fashioned in authentic octagonal style and attached to the house to maximise use and liveability. And the Mt Barker owners love it! But there’s more to this gazebo than meets the eye. It appeals for several reasons – the width is perfectly proportioned to its height and the spacings between the posts make for generous window openings. The roof is not too pointy so the structure seems to naturally nestle into its location. Jock Dean from Outside Concepts Eastern is no stranger to excellent design and quality construction. He’s been the Franchise Council of Australia’s Franchisee of the Year in 2005, 2007, 2009 (South Australia) and has a reputation for on-time delivery and eye for detail. Here he has carefully selected the materials to do their job – for structural integrity, visual appeal and for a minimum of maintenance. 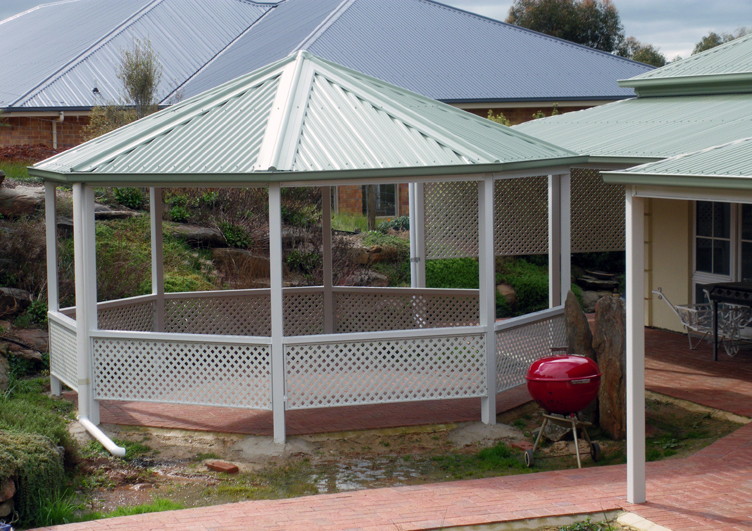 Framing components are made by Firmlok, roof sheets by Bluescope and the PVC sun tough lattice balustrade is from your local Home Hardware Store. Not hard to imagine sitting here on a balmy evening amid a natural bush garden, BBQ and beer at hand, is it?